This time of the year is supposed to be one of celebration for the National Hockey League. The Stanley Cup Finals are in full swing, the teams have battled to a decisive Game 7 on Wednesday night, and there have been stellar performances on both sides of the series. All of these things should be working in the league’s favor, but there have been several stains that have taken the spotlight away from the tremendous play we’ve seen. Unfortunately for the NHL, these Cup Finals have been marred by several nasty incidents and two serious injuries. You had Alex Burrows biting Patrice Bergeron’s finger in Game 1 of this series, and then Aaron Rome knocked Nathan Horton out of the series with a hit that netted him a four-game suspension. Monday night saw yet another unfortunate incident, as Johnny Boychuk knocked Mason Raymond out of Game 6 in the first minute of the contest on an awkward hit in the corner. Raymond was down on the ice for several minutes before skating off, but unfortunately for him and the Canucks he sustained a vertebrae compression fracture on the play and will be out several months while he recovers. Boychuk did not receive a penalty on the play, and the NHL didn’t even call him in for a disciplinary hearing on the matter, with Mike Murphy calling it a “battle for the puck” and opting not to suspend him. Understandably, Vancouver supporters immediately cried foul on the play, saying that it was a cut-and-dried case of interference and a check involving a defenseless player. The puck had clearly left the area before the hit took place, and Boychuk didn’t seem to pay any attention to that. While it wasn’t the most brutal check that anyone has ever seen, it was pretty clear that Boychuk wanted to put Raymond into the boards, puck location be damned. The result was a devastating injury for the Canucks’ forward, and he will join some other notable Vancouver players on the injury report. Several questions have arisen from this hit, and they are all worthy of consideration. 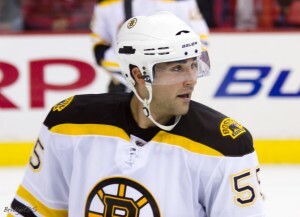 Should Boychuk have been suspended for the hit? Did the NHL make a mistake in not even reviewing the play with Boychuk? Has the league’s run of good decisions on discipline come to an abrupt halt? To answer the first query, we’ll need to discuss the other two questions. To start with, the NHL did make a mistake in not at least making Boychuk call in to discuss the incident. Even if they hadn’t suspended him, they would have definitely given off the impression that they were more serious about investigating a potentially suspendable offense, and image is key for the league when it comes to discipline. What it appears to observers now is that they didn’t think that this play was even questionable, and frankly that is wrong. There is plenty wrong with the play, and the league did itself a disservice by not realizing that. Since we’re discussing the Cup Finals, it seems appropriate to bring up the example of Rome being suspended for the remainder of the series for his hit on Horton. Yes, the league seemed to have some sound reasoning when it ruled that Rome should be banned, but that exact same reasoning should have been used in this instance. The Rome hit was ruled to be illegal because it came long enough after Horton had released the puck to be ruled late, and it was also ruled illegal because Horton was in a defenseless position when he was targeted, and that is a no-no in this day and age. Looking at the above video, that hit certainly fits both criteria. The hit came well after the puck had already left the zone (and Boychuk didn’t even seem to pay attention to the location of the puck), and it also came while Raymond was crouched down in an “L-shaped” position, which pretty much indicates that he was defenseless against a hit. It may not have been as aggressive or hard as the Rome hit, but both of those circumstances should have warranted at least a cursory look by the league. The final piece of the puzzle in determining Rome’s suspension was the severity of the injury that Horton received, and that opened up a dangerous can of worms that could have come into play on this one. As you’ll recall, the severity of Brad Stuart’s injury was taken into account by Colin Campbell when he decided to suspend Calgary’s Tom Kostopoulos for six games earlier this season, and the severe concussion that Horton sustained was the straw that broke the camel’s back when Mike Murphy was deciding Rome’s fate. In this instance, Raymond is going to be out for anywhere from three to six months, and so it would fit right into that gray area created by the two earlier decisions. Since the league failed to follow its own precedent in determining not to suspend Boychuk, it has to be said that they once again have exhibited the inconsistency that has made their disciplinary procedures into the laughingstock of the hockey world. The fact that they ignored the precedent set during this series makes it even more damning, and if the league wants to be taken seriously in terms of the way it polices itself, it has to stop doing such foolish things when it comes to handing out suspensions. Now, here’s the million-dollar question: should Boychuk have been suspended for Game 7? While it is a huge game for both clubs, and that has to be taken into account when it comes to making a decision, the right call would have been to have Boychuk sit. Murphy’s classification of the play as an “awkward collision” feels disingenuous, because this wasn’t some happenstance thing that happened on the ice. Boychuk deliberately guided Raymond into the boards, and the shove he game him, violent or not, was a bad hockey play. Johnny had plenty of time to hold up and not follow through on his check, but instead he chose to drive Raymond into the boards, and that is completely unacceptable in this situation. To make matters worse, the puck was nowhere near the play at the time of the incident. In fact, the puck went right past Boychuk as he got ready to put Raymond into the boards, and so it’s hard to argue that Johnny was completely ignorant of that fact as this play unfolded. It seems non-sensical to dismiss this as a hockey play gone bad, especially considering that Boychuk had more time to react than Aaron Rome did, and Rome will be watching Game 7 from a suite instead of from the bench while Boychuk gets to play. This type of play may not fall under the umbrella of what the league is desperately trying to get rid of (headshots), but nonetheless it still needs to be disciplined because of the lack of common sense that Boychuk showed on the play. Looking at the situation as a whole, the NHL has once again proven itself unable to adhere to a set standard when it comes to its discipline, and that is a shame. We should be celebrating the expansion of Rule 48 to protect more players, but instead we are once again having to focus on a league that can’t get its act together. Perhaps the rule of Brendan Shanahan will be different than that of Campbell or Murphy, but one thing is for certain here: no one in the hockey world will be holding their breath waiting for that to happen.